Winter salads require a little more imagination than their summer sisters. Really good tomatoes, cucumbers and delicate lettuces can be hard to find in the darker months, so I turn to hardier greens such as kale, spinach, frisee and mustard greens. Because they're sturdy and a little bitter, they can handle a strongly flavored vinaigrette such as this one, which incorporates smokey, spicy Mexican chorizo sausage. I know it sounds strange, a meat vinaigrette, but think of it as a riff on a spinach salad with bacon dressing. Makes more sense now, yes? Homemade croutons round this out and really make a difference. If you have some good parmesan cheese, a few shavings are a great addition. Wash greens in ice-cold water (makes them crisp), dry thoroughly and cut into bite-sized pieces, discarding any tough stems. Place in a large bowl and set aside. Heat sauté pan over medium heat. Add the chorizo, breaking it up into very small pieces with a fork or potato masher, and sauté until cooked through. Remove sausage to a plate lined with paper towels and drain off excess fat from pan. Return the pan to the heat and add vinegar, shallots and dijon mustard. Whisk to combine, then add oil in a slow stream, whisking to blend. Bring to a boil and let reduce for a minute, then turn heat down to a simmer and stir in chorizo, salt, and pepper. Taste and add more salt if necessary. Add croutons to greens. 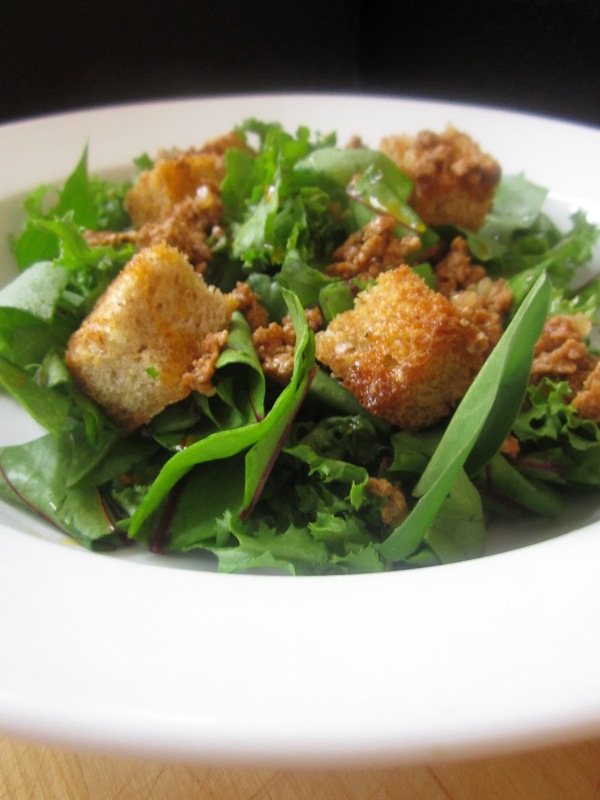 Spoon warm vinaigrette over salad, add parmesan shavings (optional) and serve immediately. Note: Vinaigrette can be made ahead of time, just heat until warmed through before serving. Remove crust from bread and cut into 3/4 inch cubes. Toss with oil, sprinkle with salt and lay out on a baking sheet (lined with parchment, if you like). Bake for 15 minutes or until golden. These are best for salad the day you make them, but you can store in an airtight container for a few days and use leftovers in soup.